Israeli Elections - Everyone Can "Vote"! It happens once in 4 years, and this time everyone can vote on these simulated Israeli Elections, featured by our Community Shaliach Arkady Hasidovich. Vote like the Israelis do, and while at it, learn what matters to contemporary Israelis through the lens of the Israeli electoral system. 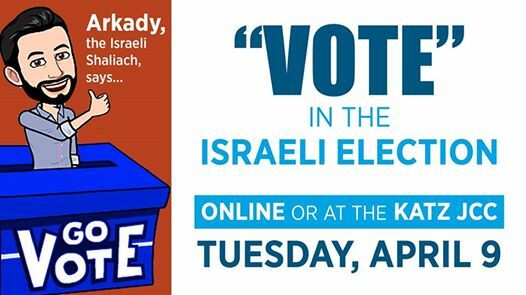 The Israeli Election Simulation will be held in the Katz JCC lobby on the election day (April 9). There will be a booth with brief summaries of party platforms and a ballot box, and participants will be able to learn about Israel’s democracy and cast a symbolic vote. Not planning to visit the building on April 9? You’ll be able to vote online.